NETWORK UPDATE: BLINDSPOT and FREQUENCY each lost 0.1 in final numbers. 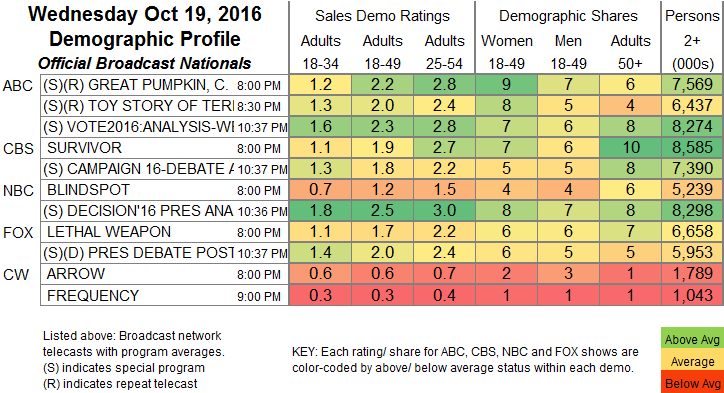 In addition, NBC’s post-Debate Analysis half-hour climbed 0.3 after adjustment, and both ABC and CBS gained 0.1. CABLE HIGHLIGHTS: The PRESIDENTIAL DEBATE ratings followed form, in that CNN led FOX News in 18-49s (2.70 vs. 2.36), but FOX News was on top in the older Total Viewers metric (11.4M vs. 8.8M), with MSNBC trailing at 1.21/5.5M, and the night’s live post-Debate DAILY SHOW on Comedy Central at 0.42. Only 2 non-Debate-related telecasts made it into the Top 10: FOX Sports 1’s coverage of the Dodgers vs. Cubs BASEBALL PLAYOFFS game at 1.83 (TBS’s afternoon Indians vs. Blue Jays game was at 0.71), and FX’s AMERICAN HORROR STORY, down a tenth from last week to 1.36. On Comedy Central, SOUTH PARK fell 0.35 to 0.76, and LEGENDS OF CHAMBERLAIN HEIGHTS was down 0.09 to 0.25. Lifetime’s LITTLE WOMEN franchise had ATLANTA down 0.11 to 0.50, and LA down 0.12 to 0.47. On Food Network, WORST COOKS IN AMERICA dropped 0.12 to 0.35. E!’s TOTAL BELLAS shrank by 0.07 to 0.32, and CATCHING KELCE was down 0.03 to 0.13. On HGTV, PROPERTY BROS fell 0.05 to 0.27. and both HOUSE HUNTERS and HOUSE HUNTERS INTL were at 0.24, the latter down 0.07. Spike’s LIP SYNC BATTLE dropped 0.14 to 0.24, and THAT AWKWARD GAME SHOW was down 0.03 to 0.11. MTV’s REAL WORLD lost 0.03 to 0.22, with the AFTER-SHOW at 0.13. On Syfy, GHOST HUNTERS gained 0.02 to 0.20, and PARANORMAL WITNESS was down 0.05 to 0.15. 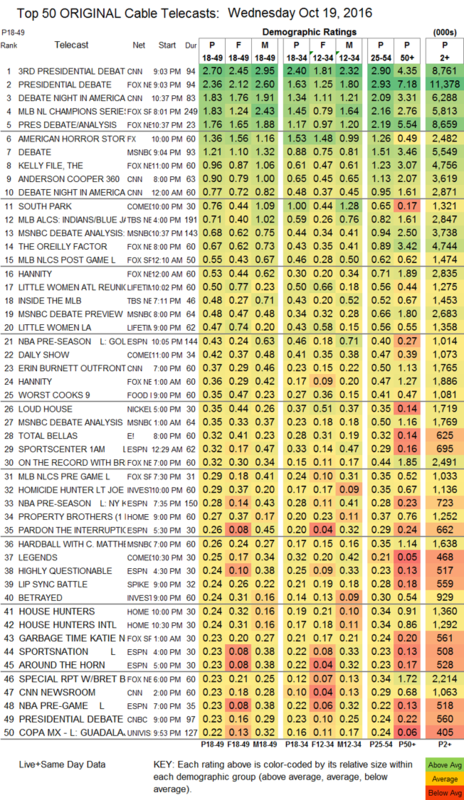 TV Land’s YOUNGER slipped 0.02 to 0.12, and IMPASTOR was steady at 0.07. FXX’s YOU’RE THE WORST gained 0.02 to 0.12. Off the chart: HBO’s ANY GIVEN WEDNESDAY returned at 0.05/115K.